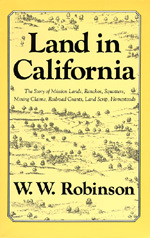 The story of California can be told in terms of its land. Better still, it can be told in terms of men and women claiming the land. These men and women form a procession that begins in prehistory and comes down to the present moment. Heading the procession are Indians, stemming out of a mysterious past, speaking a babel of tongues, and laying claims to certain hunting, fishing, and acorn-gathering areas-possessory claims doomed to fade quickly before conquering white races. Following the brown-skinned Indians are Spanish speaking soldiers, settlers, and missionaries who, in 1769, began coming up through Lower California and taking over the fertile coast valleys and the harbors of California. Their laws were the Laws of the Indies controlling Spanish colonization and governing ownership of land. Missions, presidios, pueblos, and ranchos were born in the period of these people. William Wilcox Robinson (1891-1972) wrote many pamphlets, articles, and books on Southern California history, including: Ranchos Become Cities (1939), Land in California (1948), Los Angeles, a Profile (1968), and Bombs and Bribery (1969).